We are highlighting two exciting New Book Releases for January 2019 from our New Book Releases List (click to see all the new releases). If you are looking for something new to read this is a great place to start. 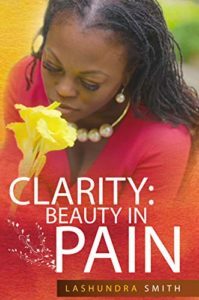 Clarity: Beauty in Pain” chronicles the painful journey of the author that is, unfortunately, also the reality of far too many little girls today. Expressed eloquently, walk with LaShundra as she shares her truths of innocence lost and rejection by those she trusted the most with the tenderness of her young heart. Through her life experiences, you are sure to reminisce on the days of your youth. Penned purposefully, Lashundra aims to aid the reader with breaking generational curses, healing broken relationships, and overcoming past pains. The woman she is today transparently reveals how GOD can create beauty through the pain. For those who hunt for the very best of the LitRPG genre, an impossible to miss new explosive release sure to catch the eye of all the fans of The Land and Awaken Online! Stan, also known as Mongoose, is an extreme traceur and a freerunner, whose real-life talents attracted the attention of The Steel Hounds, the most notorious and private clan of the virtual world of Artar, famous for serving the grey cardinal. While the political landscape for this new world is yet to form, intrigues, conspiracy, daring raids, and sabotage are the main weapons of the Hounds, and his evaluation has just begun. To complete it successfully and become a full-fledged member of the clan, Stan will have to adapt to working side-by-side with the most unique people with shady backgrounds — even if he is not a team player by nature and has already failed at the very beginning by choosing the least suitable class for teamwork: Battle Monk. Stan is rebellious, free-spirited, and daring. He risks his life every day just to avoid getting bored of the daily grind. Normally, an expelled student has no hope of entering the virtual world of Artar, an expensive online VR project, but when a suspicious organization offers to pay all expenses to let Stan in for a special purpose, Mongoose gets his chance to become one of the select few. However, to successfully complete his trial, Stan will have to face his main enemy — himself, while finding peace and mastering all five styles of the Battle Monks of Artar. 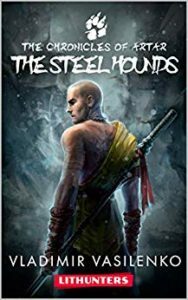 The Steel Hounds is the first book of the highly popular Russian LitRPG series The Chronicles of Artar by Vladimir Vasilenko. The brightest representative of a new wave of gamelit writers, Vladimir has created the story of Mongoose, a reckless teenager kicked out of college, who has to struggle with following strict discipline and finding inner harmony while traversing the difficult path of a Battle Monk.